LA VISTA, NE. — New Orleans Saints quarterback, Drew Brees, is scheduled to appear on May 6, 2014 as the featured speaker at the Boys Town Booster Banquet fundraiser. The event will take place at the Embassy Suites Omaha-La Vista Conference Center located at 12520 Westport Pkwy in La Vista, Nebraska. Photo shows New Orleans Saints quarteback, Drew Brees, speaking with FOX Super Bowl Daily about Super Bowl XLVIII, the Pro Bowl draft, his Super Bowl memories and more. All proceeds from the banquet will benefit and honor Boys Town student athletes and will go towards making sure each child has the proper equipment, uniform and other necessities. The event is open to the public and tickets are currently available for purchase. Individual seats are $90 each with tables of 10 available for $900. 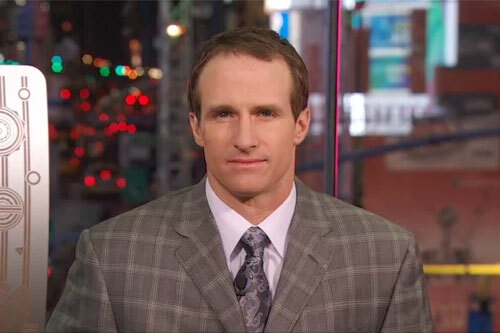 Watch Drew Brees speaking with FOX Super Bowl Daily about Super Bowl XLVIII and more. Brees is the current quarterback for the New Orleans Saints. He is a seven-time Pro Bowl selection, holds multiple NFL passing records, and led the Saints to a Super Bowl championship. The underdog Saints defeated the Indianapolis Colts 31–17 in Super Bowl XLIV on February 7, 2010. Brees tied a Super Bowl record with 32 pass completions and won the Super Bowl MVP Award. He was named the 2010 Sports Illustrated Sportsman of the Year, both for his winning the Super Bowl and his charitable work towards the reconstruction of New Orleans. Sports Speakers 360 is a booking agent for motivational sports speakers. If you would like to book athletes like Drew Brees for an event, contact Drew Brees booking agent for appearance & speaker fees. For booking agent information on how to hire New Orleans Saints players for appearances, call 1.855.303.5450.